My name is Robert Gunn and I was born in 1929 and lived in Ivory Place. When our house was condemned in 1936, we moved to the new Manor Farm Estate, to No. 14 Maresfield Road where we had an inside bathroom and toilet for the first time. 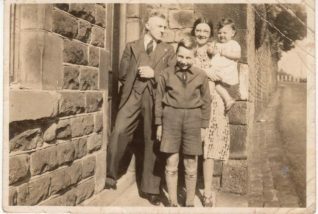 In 1941, I was evacuated to Slaithwaite in Yorkshire and stayed with a family called the Downs (pictured on the right). My brother and I were put on the train to Huddersfield and then from Huddersfield by coach to Slaithwaite. The Social volunteers put us all in a hall and the local people started turning up. My new foster parents arrived to select me. My brother and I were split up. My brother Ronald, who was about 10, was taken to a place near Halifax. His foster parents were very strict. Opposite the Downs’ house there was a butcher, who owned extensive agricultural land on which he raised chickens. I was paid for helping to feed the chickens with buckets of corn seed which I would throw and scatter over the fields. On the day I arrived, my foster father took me to buy a brand new bed in Huddersfield. Unbeknown to him I was suffering from diarrhoea from the soup-type meal we had on the train and he knocked on someone’s door to ask if I could use the toilet. With no hesitation, they said yes. This was a sign of the sort of close community I would be living in. One day there’s a knock on my door in Slaithwaite and there were two carer people holding my brother and another little boy. My brother had made up his mind to come and find me and they’d walked all over the moor – 10-12 miles over the moor – until they came across Slaithwaite. Obviously they’d asked questions to find me. My foster parents invited them in to have some tea and to be with me for about an hour. They communicated with my mother to say that her son had walked over the moors to see me. In a letter my mother wrote to my foster parents saying that she was coming up to see me and that she would then take me over to see my brother at his foster address. I accumulated a large tin of sweets from my pocket money to take to my brother. Me and my mother caught a bus to Halifax (I tripped and spilled the sweets all over the floor of the bus but I picked them up again). When we got to my brother’s address, my mother sent us out to play while she talked to my brother’s foster parents. When me and my brother returned, my mother had already decided to bring us both back to Brighton and his bags were all packed. So we returned to my foster home in Slaithwaite where we all stopped overnight. The next day we made our way back to Brighton. My mother said: “if we’re going to die, we’ll die together”. I remember Robert Gunn as I also lived in Maresfield Road until I married and migrated to Brisbane, Australia, where I now reside and I remember the kids in the street coming back from being evacuated although I never went as my Mum said the same thing – if we die, we die together. I have a photo of the Manor Farm Lads taken in 1945. we got together during the week to play football on the green adjacent to Manor Road/Maresfield Road. Ron and Bobby Gunn, Bill Eason, Frank James, Billy Verral, Derek Baker & Leslie Watts to name a few. If any of the lads are still around I would like to hear from you and will be watching for comments on this site. My brother, Jim Richards, was shot down over France in July 1944. Jim and 5 of his crew were rescued from the plane by the french resistance, unfortunately they were all dead. The village people of Magny Fouchard buried them in their village cemetery where they still rest today. All the crew were 22 years old or under; Jim was 20. I visited the graves in July 2004. It is hard to believe all this happened 60 years ago. It was a heartrending visit. When my grandfather came round to my house today, he asked to go on this website and look up an article about himself and other connections to the site. I felt quite sorry for Ron, his brother, it sounded like he had a quite complicated and sad childhood and today he is in a nursing home suffering from a mini stroke. During the war the school dental clinic (Ivory Place, Brighton) was upstairs and downstairs was a clinic for expectant mothers. My grandfather said he did look out the window having heard planes, and he did see a bomb leaving the plane, which made a direct hit. The bomb first hit a main road and went right through the wall of the market and out the other end and hit the ground, then came down directly through the front door or the clinic, killing and injuring many people in the area. My grandfather, with his mother, left the waiting room upstairs to proceed down the staircase that was half destroyed and were then witness to lots of injured and dead people. He then went to get buckets of water from neighbours to assist in treating the injured. Any one out there remember Carrie Brashill – my nan? My dad was Tony (Tom) Brazil. My mother and auntie remember your nan. Their mother was Caroline Miles (nee Brashill) they used to live in Maresfield Road, Brighton. They would like to get in contact with you. My mother is Shirley Rutson (nee Miles) and she is still living in Brighton. Rita you can contact Shirley at the following email rutson@supanet.com Hope to hear from you soon regarding your nan. My late mother (maiden name) Audrey Beare from Portslade Old Village, was taken to Hebden Bridge in Yorkshire for most of the war. She told me on many occasions how badly she was treated by her guardians. She also contracted TB which left her with scars both mental and physical. Was bad treatment common or was this just a one off? I remembered going to Brighton Station and standing there with a brown label round my neck and going to Hebden Bridge I think it took all day and I thought it was the end of the world with strange people with clogs. I lived with Mr and Mrs Greenwood at 5 Stooddle View, the most genuine and kind people I have met. He was a manager down the mill in Hebden Bridge and made me a suit of worsted. I went to school up Heptonstall? Did anybody attend this school? Some of the boys rode their horses to school. I was about 7 years of age when I was evacuated to Hebden Bridge from Brighton by train. The only thing I remember about the journey was that we stopped overnight somewhere which was a bit scary. I think it must have been workhouse place or something with a lot of old men. I was billeted with Mr & Mrs Sager in Old Town at the top of the hill, on the edge of the moors. They had a son Edward who I got on very well with and I enjoyed my time there very much. However, after about 9 months my mum came and took me home. Apparently I had a strong Yorkshire accent! I’ve never been back to the area but looking at it on Google Earth, it brings back many memories. I too was sent to Yorkshire with my brother. When we arrived in Wakefield they took us to the hospital where we stayed the night. The following morning they took us to several mining villages. My chum Dicky Askew and I were left with an old couple just for the one night. They couldn’t understand what we were talking about, nor could we understand them. Me and my mate then lived at 20 Brooklands View, Walton. My brother was living in Crofton. As my mum was left on her own, she took us home 4 months later.